On 7 July 2015 my husband James and I travelled to Morphou (Güzelyurt) to meet with two Turkish Cypriot refugees who live there. We met at the Cumhuriyetçi Türk Partisi (CTP) office in Güzelyurt. The CTP is a social-democratic political party in Northern Cyprus which is pro-unification of the island. Several of the men that I interviewed in Morphou belonged to this political party, and it served as a good location to do the interviews because it had a large conference room. 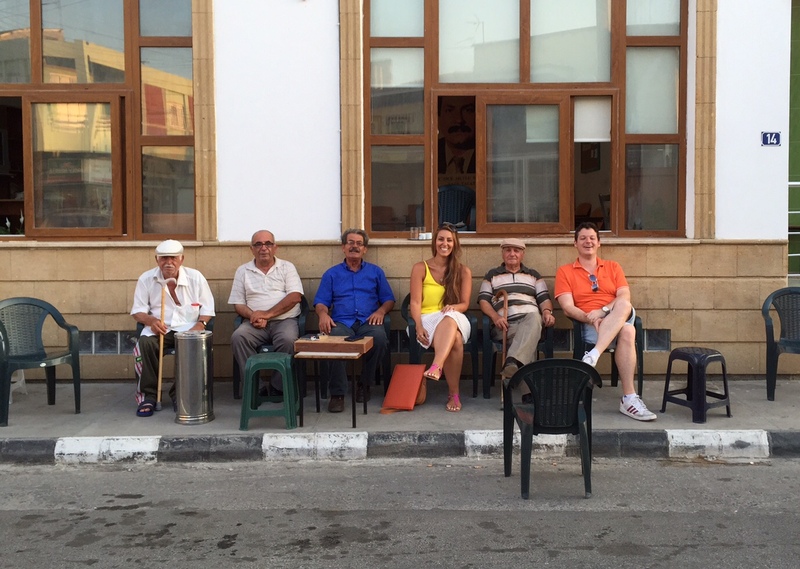 The first man I interviewed was Emir, the sweetest old man whose soft and kind nature reminded me of my pappou Costas. Emir was born in 1933 in the village Souskiou in the Paphos district. He lived in Egypt for six months after WWII, in 1951, fixing shoes and boots in the army. He then spent three years in Lefkosia and afterwards returned to Paphos. When the war broke out in 1974 he fled to Morphou. Souskiou was a mixed village with a Turkish Cypriot majority. Emir learnt Greek as a child in order to speak with his Greek Cypriot friends in the village. Many of his friends spoke a little bit of Turkish too. He used to go fishing with his Greek Cypriot friends when they were children, they also played marbles and a Cypriot game called ‘Linkri / Lingiri’ – a traditional street game that children played with wooden sticks in the old days. They were not allowed to play card games until they turned 18 years old. Emir knew of some linopampakoi – Cypriots who adhered to both Christianity and Islam and had both a Greek and Turkish name – from the village Pegeia, just north of Kissonerga in the Paphos district. He also knew of an intermarriage between a Turkish Cypriot man and a Greek Cypriot woman (who still live in Morphou)! Emir had three years of schooling and then, “my parents sent me to work because we were very poor”. He recalled a time before 1960, when Turkish and Greek Cypriots were often koumbaroi for each other’s weddings (groomsmen and bridesmaids), that the whole village would celebrate weddings, pascha (Easter), bayram (ramazan), and attend funerals together. He visited the church in the village several times to attend the Christian events. He worked as a fisherman and a shoe repairer alongside Greek Cypriots during this time. James and I sitting with Niyazi, Ibrahim and Emir outside of the CTP office. From 1955 to 1960 he served as a police officer in the British Army’s fight against the Greek Cypriot group EOKA (a right-wing group who fought for independence from Britain and union (enosis) with Greece). Although he had many Greek Cypriot friends who were members of EOKA, he never turned them in to the British authorities. He enjoyed living in his small and friendly village up until 1960 came around, when all of the Greek Cypriots of the village fled to a neighbouring village, Koukla, due to civil tension. Emir recalls the period of 1963-1974 as being “very tense” in Cyprus. Emir married in 1965 and has four children, two sons and two daughters. As a young man, Emir identified as a “Cypriot Turk”, however when I asked him what his identity is now, he replied “independent” and we all laughed. He stills considers himself as a Cypriot Turk. However, Emir enjoys drinking alcohol and eating pork. He has visited his Greek Cypriots friends who live in Kato Paphos since the border opened in 2003; however he said that not many Greek Cypriots visit him in Morphou. 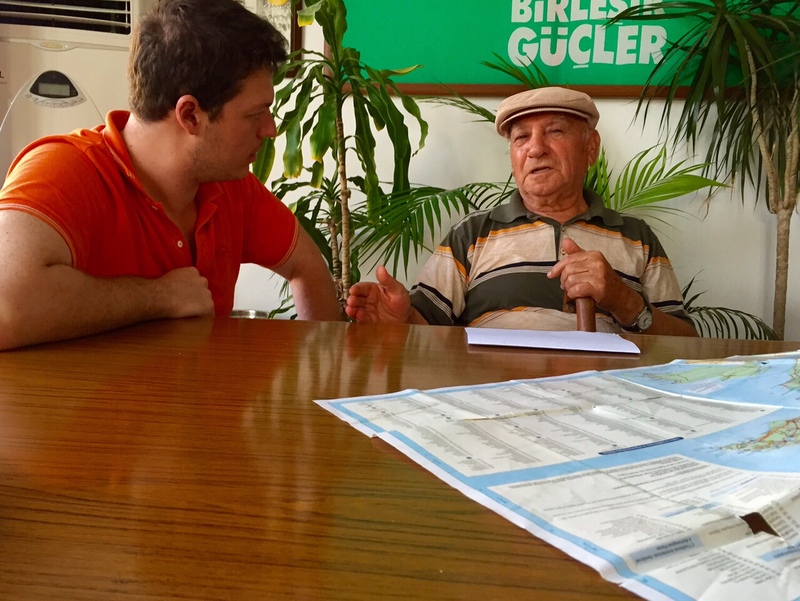 The second man I interviewed was Alkan, who ran the CTP office in Güzelyurt. He grew up in Silikou, a Greek Cypriot majority mixed village in the Lemesos district. He then moved to Polemidia when he got married in 1973. Alkan speaks Turkish, Greek and English. He and his Greek Cypriot friends would play together at the beach and spend time in the kafeneion (café) together. “We drank together and worked together, like brothers!” He visited the village church as a child, where he would play with his Greek Cypriot friends. He later visited the church, along with many other Turkish Cypriots of Silikou, to attend Greek Cypriot weddings. Alkan also remembers when Turkish and Greek Cypriots would be koumparoi for one another, “they would help pay for the wedding and gave sheep and potatoes”. Alkan’s face lit up when he spoke of the mischief that he and his Greek Cypriot friends got up to when they were growing up. He remembers riding his bike to a beach called ‘Lady’s Mile’ with his Greek Cypriots friends, where they would steal people’s potato chips! He also remembers a night when his Greek Cypriot friends from Polemidia wanted to go to a bar in Lemesos, “they drank too much and then the police came, so they ran away and went to another bar; the police did not find them”, he laughed. His father served in the Cyprus Regiment of the British Army during WWII and fought in Germany. Luckily he returned to Cyprus afterwards. Alkan had 7 years of school and later worked with Greek Cypriots at the British Army base in Akrotiri, where they helped at a non-for-profit gift shop for the Young Christian Women’s Club. When war broke out in 1974, most refugees from Polemidia fled to Episkopi. Alkan ran away, and after two days he arrived at the British base at Akrotiri. He asked UN officials there to bring his family to the camp – which they did. They were then flown to Adana in Turkey and then finally settled in Morphou (Güzelyurt) in 1975. In 1974 Greek soldiers from mainland Greece went to Silikou with the intention of harming Turkish Cypriots, however Alkan recalls that the Greek Cypriots of Silikou “would not let the soldiers harm them and kicked them out of the village”. Alkan’s identity has changed over the years. As a young man he identified as Turkish Cypriot, now he identifies as Cypriot. “Greek or Turkish, it doesn’t matter” he said. He knows of many intermarried couples from Paphos who live in Morphou today. Alkan visits Polemidia once or twice a month. When he saw his Greek Cypriot friends for the first time since the border opened they laughed and cried, “We were so happy” he said. When he visited in June 2015, Alkan helped restore the Jamii (mosque) in Polemidia. His Greek Cypriot friends also visit him in Morphou. He hopes for a day when his beautiful island is reunified.